The Italian car maker has now set hands on Smartphones and tablets. Lamborghini, the luxury car makers is set to make a mark in the Smartphone market, or so it seems. These Smartphone lineups will be known as “luxury Android devices”. But this piece of junk is believed to be an absolute waste. 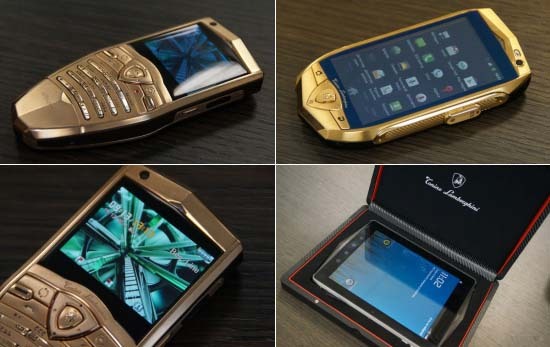 This Lamborghini device comes up with Android 2-3 and has 2-3 GHz Qualcomm processor. It has a display of 800 x 480 pixels at 3.7 inches with two cameras; the front camera is 0.3MP and the back is 5MP. The Lamborghini tablet is said to be even worse than the Smartphone. The processor used is 1.2 GHz and sports 512 MB of RAM and 4GB of internal memory, but surely it can be extended with an SD card slot. It has two dreadful cameras with the front camera being only 2MP and the back camera will be same as that of smartphone 5MP. But only the silver lining will be the 9.7 inch display at a display of 1024 x 768 pixels. It will also have 2.3 Android, but can be upgraded to 4.0. The Lamborghini Smartphone will cost at about $2,760 USD and the tablet will come up at $2,291 USD. Definitely with the price set it does not look like a worthy of that.